Friday night midtown Manhattan welcomed Jason Pierce for his most ambitious show in, well…ever. As the man who literally is Spiritualized, Pierce brought with him a band, a choir, a string section and a horn section for one night, and one night only. One could only assume that this show was staged for something more than just for the hell of it. Dressed in all white and practically sitting in the wing, Pierce commanded the attention of all 30 people on stage who watched his every move. It was clear that no matter how “not important” he tried to make himself appear, he was the dominating force of the evening. Spiritualized never reached the popularity that Oasis or Coldplay or even The Verve enjoy, but the songs wore the air of divinity, instead of mere shallow, emo-ish British Rock. And with the iconic sample that begins “Ladies and Gentlemen, We are Floating in Space,” so too began the evening. We knew what we were going to see, but no one really knew what to expect. I soon learned that I should have known exactly what to expect all along. Simple, elegant beauty. The choir backed up Pierce’s longing, desperate vocals perfectly. The strings and horns weren’t over dominating at any time but instead blended into the rock band with ease. It was a pleasure to hear real, live instruments instead of lifeless keyboards and samples. It was how Spiritualized always wanted their music to sound – Huge. Soaring. Epic. Highlights included the anthem “Come Together,” the haunting “Cop shoot Cop,” and a 2 song encore of “Out of Sight” and “Oh, Happy Day.” The lights were vague and subtle. 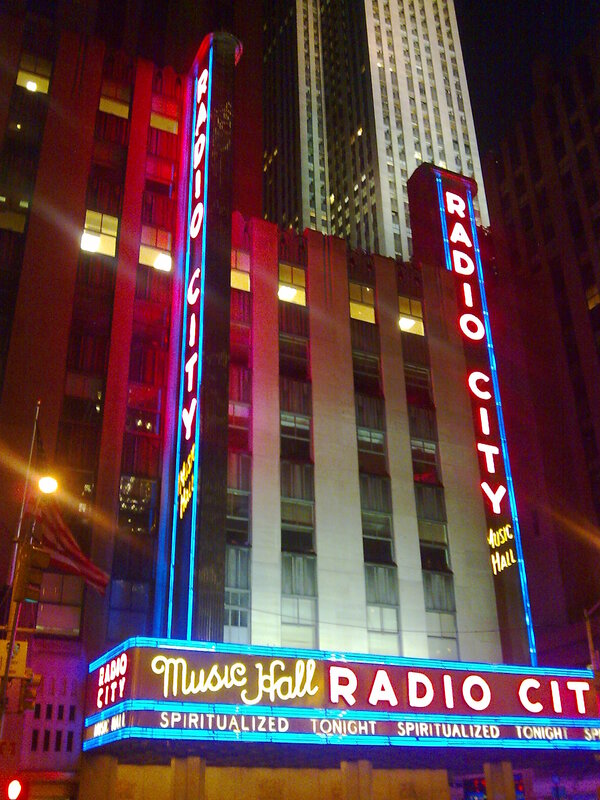 There were no gimmicks or lasers or props, just the music to speak for itself. Surely you can always tell that the words written 15 years ago still meant something to little J. They still speak to me. okay, not the best seats in the house, but they were at least in the house! It would be almost impossible, at times, to convince someone unfamiliar with the band that it was indeed not religious music, per se. The emotional ebb and flow, the choir robed in white, and the soaring crescendos are reminiscent of a classic spiritual. The only difference is that the preacher crones his message softly while sitting, squeezing every bit of catharsis from his guitar. 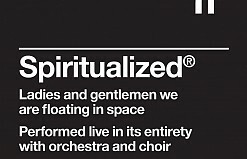 In reality, Spiritualized is a veiled reference to Absinthe, and Pierce worships escape from reality. The story behind the album is certainly depressing (although he still denies it)A. 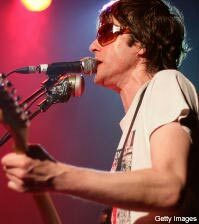 After literally turning a dysfunctional experiment into one of the best selling British acts along side his girlfriend, Pierce’s wife secretly married Richard Ashcroft from The Verve 4 days before the two bands shared one stage. It’s hard to believe Pierce still has it in him to want to relive that mess in it’s entirety at all. The show was not without flaws. A false opening of the curtain at the beginning teased the crowd before closing abruptly again. There was a sprinkling of speaker feedback that I’m sure will be gone when the dvd is released. Who could blame them with all those microphones on stage anyway. And the crowd was an uncomfortable mix of pleasant fans who wished to sit and enjoy the music (us) and those who thought that if they could only clamor 10 rows closer, the music would sound so much better and photos would be so much cooler when they showed their friends on Facebook the next day (assholes). In the end I don’t know if a dvd will be coming. They had the cameras there for Spin, so it could be easily done. I’m not really sure why Jason Pierce put the band back together, in this grand fashion, to play just one show across the pond. He could have sold out a dozen shows I’m sure. Being able to see the only one is, quite simply, monumental. In the end, though, I don’t think Mister Spaceman staged this show for his fans…he staged it as a sort of therapy for himself.